The Niagara Independent, September 28, 2018 – In December, U.S. President Donald Trump unveiled a tax plan that effectively cuts America’s top corporate tax rate from 35 per cent to 20 per cent and allows companies to immediately deduct from their tax bills the full cost of capital spending. Proponents of the tax package predict this will boost business investment in the United States and encourage U.S. companies to repatriate money they previously held abroad. 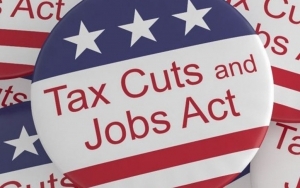 In a recently released economic report by PricewaterhouseCoopers (PwC), Canadians are warned that the American tax plan will siphon 650,000 jobs from Canada over the next 10 years as businesses shift their activity south of the border. Most striking statement in the report, however, is the fact that the negative impact of this U.S. tax reform on Canada’s economy could be 10 times greater than the potential fallout of a failed NAFTA agreement. The American tax plan has altered the playing field that drastically. Canada’s combined federal and provincial corporate tax rate remains about 27 percent, a total of seven percentage points above the U.S. tax rate. Foreign investors are staying away from the country and 2017 Statistics Canada figures reveal foreign investment is flowing freely from Canada at unprecedented rates. Foreign direct investment into our country is at a low of $30 billion. In contrast, the investment Canadians make abroad has now reached a record $100 billion. This compounds the problem that our Canadian business community is already suffering from a lack of investment. A 2017 study by Philip Cross, former chief analyst at Statistics Canada, ranked Canada 16th of 17 countries for business investment between 2015 and 2017 with this Liberal Government, compared to eighth place from 2009 to 2014. The C.D. Howe Institute complements this study with one of its own that finds capital spending by Canadian businesses has plummeted with this Liberal Government. For every dollar of new investment enjoyed by the average U.S. worker in 2017, a Canadian worker enjoyed a mere 59 cents — by far the worst recorded performance in Canada ever. This sets the stage for the federal government’s fall economic update expected in October. Finance Minister Bill Morneau has repeatedly dismissed across-the-board cuts to the tax rate on business income. However, in the face of mounting pressure from Canadian business leaders, finance department officials are now hinting Mr. Morneau’s update will include targeted tax measures to boost the country’s competitiveness. So, as Canadians are transfixed by the collapse of the NAFTA negotiations, our country’s business leaders are anxiously awaiting the government’s response to a fate potentially ten times worse.